Walking into this exhibition to the sound of Piaf and a proliferation of black and white images felt like an invitation to pleasurable nostalgia. 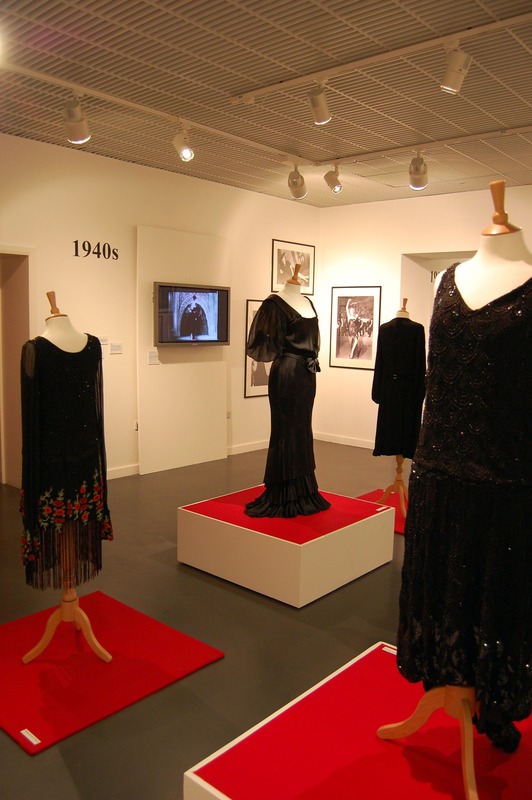 Arranged chronologically, the visitor moves by decades from the 1920s through into the 1990s and then onwards to a line-up of little black dresses, the work of 25 different designers, some known internationally, some local to the area. Yet what lends this exhibition its coherence is the ubiquity of black, the sameness of ‘little’, flattering dresses, photographed, displayed and also there to be witnessed in archival catwalk footage. One question pervades the exhibition. 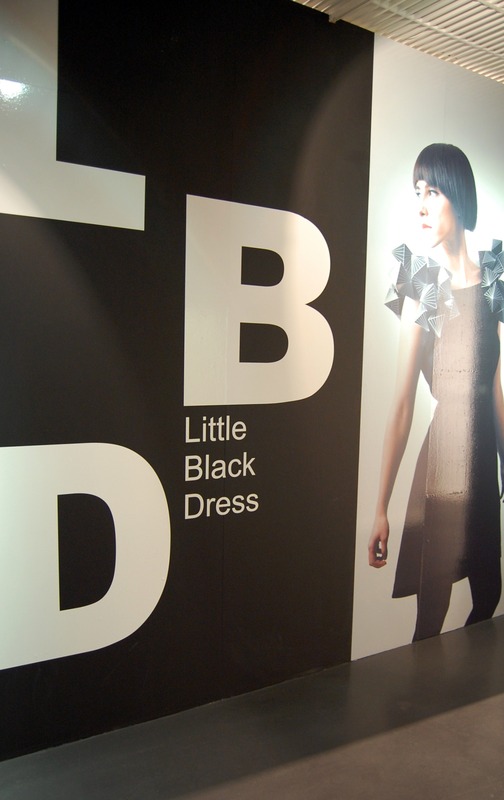 What is it that makes the LBD such an enduring prototype for different designers, different media stars – from Marlene to Jackie Kennedy, from Hepburn to Diana Princess of Wales, and for ordinary women who embraced the Dior ‘New Look’ in some form in the 1950s, the 1960s beatnik turtleneck and slim pants, the mini, 1970s punk, 1980s power dressing extravagance, 1990s sexiness of underwear as outwear, black lace and slits to the thigh? Bill Blass, a designer, said that if you felt you were too big then black made you look thinner and smaller – and if you thought you were too small, then black made you look important. His statement suggests that the LBD might be more about conformity than individuality, yet the items on display also undermine this view. Along with its extreme versatility, as the LBD is continuously reinvented to reflect changing gender relations, new technologies and emergent trends in art, it is described as ‘timeless’ in its appeal, the easy and reliable answer to the ‘what shall I wear today’ question. For me, the re-locating of black dresses from World War One mourning to fashion wear was particularly interesting – not that mourning dress was in any sense fashion, or status neutral. When Coco Chanel first conceived of the LBD in the 1920s, she saw it as a style and colour that she could reclaim from its clerical and deathly associations. With her concern to explore the scope of ‘masculine’ tailored simplicity for enhancing ‘feminine’ chic, she launched the little black ‘Ford’ dress, so called because of its mass appeal, a dress that outsold Ford cars. What the exhibition’s curator, Polyanna Clayton-Stamm, has laid out so accessibly in its panels is the subsequent career of Chanel’s LBD, its ultra-simple, modernist silhouette. The contributions of Schiaparelli and Surrealism, the varying demands of Hollywood’s silent movies and the ‘talkies’, and Film Noir of the 1940s, stand alongside evidence of the capacity of black to stand for both high end, elite fashion as well as 1960s’ beatnik anti-fashion and punk’s appropriation of sexual fetishism, black rubber, plastic, leather, fishnet. What would the ‘Little Black Dress’ of shoes be? These would probably be mine. I bought them years ago and they are very well worn but I can always depend on them and they’re very versatile – they’re my old faithfuls!